Based on Chinese philosophy and traditional medicine theory, tai chi is a movement therapy that seeks to harmonize the Yin and Yang vital forces and promote the flow of energy in the body known as Qi to improve health. It coordinates a series of prescribed movements with meditation and breathing exercises. Clinical trials of tai chi have been conducted in elderly, frail, and disabled patients, and those with chronic conditions such as fibromyalgia, arthritis, Parkinson’s disease, heart disease, and cancer. These studies show that tai chi can improve sleep, strength, stamina, flexibility, balance, blood pressure, physical functioning, mental outlook, and awareness. It can also reduce stress, risk of falls, and bone loss. Tai chi can be practiced by people of all age groups as the movements are gentle with little stress on the body. Like other mind-body approaches, benefits obtained from this modality increase with regular practice. Tai chi practice can improve posture, movement control, and ability to walk, in part due to the gradual weight shift that occurs with the lower and upper limbs. Slow foot movements such as forward heel-to-toe and backward toe-to-heel motions also improve flexibility, stamina, and muscle tone. The practice of moving from wide to narrow stances as well as turning in the movements expands the number of situations under which the body experiences support. The coordinated breathing used along with the exercises helps to improve lung function. Taken together, these details within the exercises are the mechanisms that serve to improve balance while reducing risk of falls. Tai chi has also been shown to reduce inflammation that is linked with many chronic diseases, including heart disease and cancer. Several studies show that tai chi improves balance which may also help to reduce the risk of falls. A clinical trial found that a combination tai chi/qi gong program reduced fatigue in breast cancer patients. A randomized trial showed that tai chi was as good or even better than aerobic exercise to reduce fibromyalgia symptoms. Several studies show that tai chi can improve muscle strength, flexibility, stamina, and stable posture in a variety of populations including cancer patients. Tai chi is generally considered to be safe. It is advisable that patients with musculoskeletal injuries consult their physician before starting a tai chi program. Many hospitals, cancer centers, and community and senior centers offer tai chi classes. Patients with muscle and bone injuries should consult their physician before starting tai chi practice. Tai chi is an exercise program that uses a sequence of precise body movements, meditation, and synchronized breathing to improve health and well-being. Based on Chinese philosophy and traditional medicine theory, tai chi exercises are thought to harmonize the Yin and Yang vital forces and promote the flow of Qi, or internal energy, to improve health. Like most moderate physical activities, tai chi can improve stamina, muscle tone, agility, and flexibility. The coordinated practice of breathing along with the exercises may serve a meditative function to increase awareness and reduce stress. Reviews of clinical trials show that tai chi practice has many benefits including reduced pain and improved flexibility and strength (1) (2). Clinical studies in women showed that tai chi is effective in slowing bone loss (3), reducing multiple fracture-related risks (4), and improving physical function (5). Along with resistance training and diet intervention, tai chi significantly improved mobility measures in obese older women (6). In a comparative effectiveness trial, tai chi compared with aerobic exercise had similar to significantly greater benefits for patients with fibromyalgia (52). In studies of potential benefits for joint diseases, tai chi improved range of motion in patients with rheumatoid arthritis (7) (8), reduced knee osteoarthritic pain (9), and improved functional fitness and physical and mental health among ethnically diverse participants (10). In patients with end-stage hip osteoarthritis, a combined tai chi/strength training program improved balance and aerobic capacity, but not pain or side hip motion (11). For older adults with previous fall-related emergency department visits, those who were given a tai chi intervention were less likely to experience subsequent falls than those given a lower-extremity training (12). Another study among disabled elderly did not find a group-based tai chi program to be effective, perhaps due to insufficient intervention or low attendance (13). Tai chi can also provide benefits in patients with other chronic conditions. It improved aerobic capacity in sedentary adults (2) and respiratory function in patients with COPD (14), although a systematic analysis did not show superiority with tai chi over other interventions for this condition (15). Tai chi improved quality-of-life (QoL) for those with chronic heart failure (16) (17), and reduced hypertension and associated risk factors (9) (18) (19), reversed markers of inflammation (20), and improved sleep (21) and physical function (22) in elderly individuals. Another study suggests that sleep improvements occur after long-term rather than short-term practice in patients with chronic insomnia (23). At a molecular level, tai chi was reported to reduce cellular inflammatory responses and to decrease expression of genes encoding pro-inflammatory mediators, both associated with sleep disturbance, in older adults with insomnia (49). In a small study of chronic stroke patients, tai chi improved balance, gait, and QoL (24). In patients with recent myocardial infarction, tai chi was associated with increased peak oxygen consumption, suggesting its application in cardiac rehabilitation (25). Patients with fibromyalgia reported significant symptom improvements following a tai chi exercise program (26) (27), and in patients with Parkinson’s disease (28) (29) and multiple sclerosis (30), tai chi improved balance and reduced risk of falls. It was also found to be more cost-effective for patients with mild-to-moderate Parkinson’s disease than resistance training or stretching, with better fall reduction outcomes (31). Tai chi produced benefits in pain reduction and QoL similar to conventional neck exercises for participants with chronic neck pain (32). Studies in younger populations are few. Tai chi programs improved self-concept in adolescents (33) as well as flexibility and balance among college students (34). It is also among the complementary health approaches use in children aged 4–17 years, with higher usage among girls than boys, although overall usage among this age group is still small (35). Preliminary data suggest that tai chi improves QoL (36) (37) and neuropsychological functioning in cancer patients (38). It was shown to be a feasible and acceptable modality among senior cancer survivors as well (39), and may help to reduce their risk factors for other chronic diseases (19). In a study of breast cancer survivors, tai chi practice resulted in clinically relevant, sustained improvements in insomnia, and was equally effective as cognitive behavioral therapy for insomnia (CBT-I) (50). A combination qi gong/tai chi exercise program was also found to improve fatigue, depression, and sleep dysfunction in breast cancer survivors (40). A meta-analysis also found significant improvements in cancer-related fatigue, sleep difficulty, depression, and overall quality of life (53). Tai chi can be practiced by people of all age groups and has been found to have a good adherence rate (17) (22) as the movements are gentle and there is a low risk for injury. Improved postural control and walking ability are due to specific features that characterize the tai chi protocol, in which weight shifting and ankle sway move one’s center of gravity toward the limits of stability (28). Alternating narrow and wide stances continually change the base of support, increase support-leg standing and trailing-leg swing time, and encourage rotation of the torso with an upright posture. Forward heel-to-toe and backward toe-to-heel steps strengthen dorsiflexion and plantar flexion, respectively. Improvements in mobility are attributed to the increased flexibility and balance that may occur with regular tai chi practice (6), and are also the mechanisms by which this modality helps to prevent falls (41). Tai chi particularly appears to alleviate bradykinetic movements associated with Parkinson’s disease by improving gait characteristics such as maximum excursion, while reducing deviation in movement (eg, reaching forward to take objects from a cabinet; transitioning from seated-to-standing / standing-to-seated positions) and markedly increasing gait velocity and stride length (28). Several studies evaluating biomarker changes with tai chi indicate that the physical aspects of this exercise mediate reductions in both decreased fat mass and IL-2 levels along with increased fat-free mass and IL-6, while the meditative component may also contribute to anti-inflammatory effects (42). Declining pro-inflammatory cytokine IL-2 levels further result in increased bone formation and metabolism levels (43). Other anti-inflammatory effects include increased superoxide dismutase activity with reduced IL-1β (44). Tai chi may also improve health-related QoL by regulating other inflammatory responses and biomarkers (37). Tai chi is generally considered to be safe (19). Adverse events have not yet been reported in studies of tai chi for patients with COPD (15), Parkinson’s disease (29), or cancer (39) (45). Additional studies are further evaluating safety in patients with cardiovascular (46) (47) and Parkinson’s disease (48). It is advisable that patients with musculoskeletal injuries consult their physicians before starting a tai chi program. Tai chi classes are offered in many hospitals, cancer centers, and community and senior centers, generally by experienced instructors. Klein PJ, Adams WD. Comprehensive therapeutic benefits of Taiji: a critical review. Am J Phys Med Rehabil. Sep 2004;83(9):735-745. Taylor-Piliae RE, Froelicher ES. Effectiveness of Tai Chi exercise in improving aerobic capacity: a meta-analysis. J Cardiovasc Nurs. Jan-Feb 2004;19(1):48-57. Chan K, Qin L, Lau M, et al. A randomized, prospective study of the effects of Tai Chi Chun exercise on bone mineral density in postmenopausal women. Arch Phys Med Rehabil. May 2004;85(5):717-722. Song R, Lee EO, Lam P, et al. Effects of tai chi exercise on pain, balance, muscle strength, and perceived difficulties in physical functioning in older women with osteoarthritis: a randomized clinical trial. J Rheumatol. Sep 2003;30(9):2039-2044. Maris SA, Quintanilla D, Taetzsch A, et al. The combined effects of tai chi, resistance training, and diet on physical function and body composition in obese older women. J Aging Res. 2014;2014:657851. Han A, Robinson V, Judd M, et al. Tai chi for treating rheumatoid arthritis. Cochrane Database Syst Rev. 2004(3):Cd004849. Lee MS, Pittler MH, Ernst E. Tai chi for rheumatoid arthritis: systematic review. Rheumatology (Oxford). Nov 2007;46(11):1648-1651. Tsai PF, Chang JY, Beck C, et al. A supplemental report to a randomized cluster trial of a 20-week Sun-style Tai Chi for osteoarthritic knee pain in elders with cognitive impairment. Complement Ther Med. Aug 2015;23(4):570-576. Dogra S, Shah S, Patel M, et al. Effectiveness of a Tai Chi intervention for improving functional fitness and general health among ethnically diverse older adults with self-reported arthritis living in low-income neighborhoods: a cohort study. J Geriatr Phys Ther. Apr-Jun 2015;38(2):71-77. Zeng R, Lin J, Wu S, et al. A randomized controlled trial: preoperative home-based combined Tai Chi and Strength Training (TCST) to improve balance and aerobic capacity in patients with total hip arthroplasty (THA). Arch Gerontol Geriatr. Mar-Apr 2015;60(2):265-271. Hwang HF, Chen SJ, Lee-Hsieh J, et al. Effects of Home-Based Tai Chi and Lower Extremity Training and Self-Practice on Falls and Functional Outcomes in Older Fallers from the Emergency Department-A Randomized Controlled Trial. J Am Geriatr Soc. Mar 2016;64(3):518-525. Day L, Hill KD, Stathakis VZ, et al. Impact of tai-chi on falls among preclinically disabled older people. A randomized controlled trial. J Am Med Dir Assoc. May 1 2015;16(5):420-426. Chan AW, Lee A, Lee DT, et al. The sustaining effects of Tai chi Qigong on physiological health for COPD patients: a randomized controlled trial. Complement Ther Med. Dec 2013;21(6):585-594. Ngai SP, Jones AY, Tam WW. Tai Chi for chronic obstructive pulmonary disease (COPD). Cochrane Database Syst Rev. 2016(6):Cd009953. Yeh GY, Wood MJ, Lorell BH, et al. Effects of tai chi mind-body movement therapy on functional status and exercise capacity in patients with chronic heart failure: a randomized controlled trial. Am J Med. Oct 15 2004;117(8):541-548. Yeh GY, McCarthy EP, Wayne PM, et al. Tai chi exercise in patients with chronic heart failure: a randomized clinical trial. Arch Intern Med. Apr 25 2011;171(8):750-757. Sun J, Buys N. Community-Based Mind-Body Meditative Tai Chi Program and Its Effects on Improvement of Blood Pressure, Weight, Renal Function, Serum Lipoprotein, and Quality of Life in Chinese Adults With Hypertension. Am J Cardiol. Oct 1 2015;116(7):1076-1081. Campo RA, Light KC, O’Connor K, et al. Blood pressure, salivary cortisol, and inflammatory cytokine outcomes in senior female cancer survivors enrolled in a tai chi chih randomized controlled trial. J Cancer Surviv. Mar 2015;9(1):115-125. Irwin MR, Olmstead R, Breen EC, et al. Cognitive behavioral therapy and tai chi reverse cellular and genomic markers of inflammation in late-life insomnia: a randomized controlled trial. Biol Psychiatry. Nov 15 2015;78(10):721-729. Li F, Fisher KJ, Harmer P, et al. Tai chi and self-rated quality of sleep and daytime sleepiness in older adults: a randomized controlled trial. J Am Geriatr Soc. Jun 2004;52(6):892-900. Manor B, Lough M, Gagnon MM, et al. Functional benefits of tai chi training in senior housing facilities. J Am Geriatr Soc. Aug 2014;62(8):1484-1489. Carroll JE, Seeman TE, Olmstead R, et al. Improved sleep quality in older adults with insomnia reduces biomarkers of disease risk: pilot results from a randomized controlled comparative efficacy trial. Psychoneuroendocrinology. May 2015;55:184-192. Kim H, Kim YL, Lee SM. Effects of therapeutic Tai Chi on balance, gait, and quality of life in chronic stroke patients. Int J Rehabil Res. Jun 2015;38(2):156-161. Nery RM, Zanini M, de Lima JB, et al. Tai Chi Chuan improves functional capacity after myocardial infarction: A randomized clinical trial. Am Heart J. Jun 2015;169(6):854-860. Taggart HM, Arslanian CL, Bae S, et al. Effects of T’ai Chi exercise on fibromyalgia symptoms and health-related quality of life. Orthop Nurs. Sep-Oct 2003;22(5):353-360. Wang C, Schmid CH, Rones R, et al. A randomized trial of tai chi for fibromyalgia. N Engl J Med. Aug 19 2010;363(8):743-754. Li F, Harmer P, Fitzgerald K, et al. 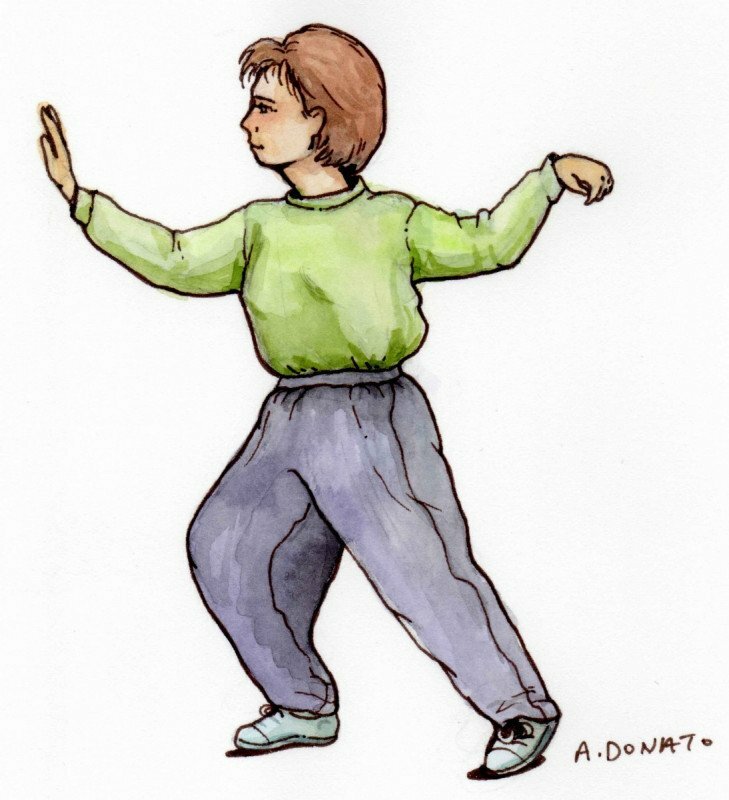 Tai chi and postural stability in patients with Parkinson’s disease. N Engl J Med. Feb 9 2012;366(6):511-519. Zhang TY, Hu Y, Nie ZY, et al. Effects of Tai Chi and Multimodal Exercise Training on Movement and Balance Function in Mild to Moderate Idiopathic Parkinson Disease. Am J Phys Med Rehabil. Oct 2015;94(10 Suppl 1):921-929. Azimzadeh E, Hosseini MA, Nourozi K, et al. Effect of Tai Chi Chuan on balance in women with multiple sclerosis. Complement Ther Clin Pract. Feb 2015;21(1):57-60. Li F, Harmer P. Economic Evaluation of a Tai Ji Quan Intervention to Reduce Falls in People With Parkinson Disease, Oregon, 2008-2011. Prev Chronic Dis. 2015;12:E120. Lauche R, Stumpe C, Fehr J, et al. The Effects of Tai Chi and Neck Exercises in the Treatment of Chronic Nonspecific Neck Pain: A Randomized Controlled Trial. J Pain. Jun 23 2016. Bao X, Jin K. The beneficial effect of Tai Chi on self-concept in adolescents. Int J Psychol. Mar 2015;50(2):101-105. Zheng G, Lan X, Li M, et al. Effectiveness of Tai Chi on Physical and Psychological Health of College Students: Results of a Randomized Controlled Trial. PLoS One. 2015;10(7):e0132605. Black LI, Clarke TC, Barnes PM, et al. Use of complementary health approaches among children aged 4-17 years in the United States: National Health Interview Survey, 2007-2012. Natl Health Stat Report. Feb 10 2015(78):1-19. Mustian KM, Katula JA, Gill DL, et al. Tai Chi Chuan, health-related quality of life and self-esteem: a randomized trial with breast cancer survivors. Support Care Cancer. Dec 2004;12(12):871-876. Sprod LK, Janelsins MC, Palesh OG, et al. Health-related quality of life and biomarkers in breast cancer survivors participating in tai chi chuan. J Cancer Surviv. Jun 2012;6(2):146-154. Reid-Arndt SA, Matsuda S, Cox CR. Tai Chi effects on neuropsychological, emotional, and physical functioning following cancer treatment: a pilot study. Complement Ther Clin Pract. Feb 2012;18(1):26-30. Campo RA, O’Connor K, Light KC, et al. Feasibility and acceptability of a Tai Chi Chih randomized controlled trial in senior female cancer survivors. Integr Cancer Ther. Nov 2013;12(6):464-474. Larkey LK, Roe DJ, Weihs KL, et al. Randomized controlled trial of Qigong/Tai Chi Easy on cancer-related fatigue in breast cancer survivors. Ann Behav Med. Apr 2015;49(2):165-176. Winters-Stone K. Tai Ji Quan for the aging cancer survivor: Mitigating the accelerated development of disability, falls, and cardiovascular disease from cancer treatment. J Sport Health Sci. Mar 1 2014;3(1):52-57. Janelsins MC, Davis PG, Wideman L, et al. Effects of Tai Chi Chuan on insulin and cytokine levels in a randomized controlled pilot study on breast cancer survivors. Clin Breast Cancer. Jun 2011;11(3):161-170. Peppone LJ, Mustian KM, Janelsins MC, et al. Effects of a structured weight-bearing exercise program on bone metabolism among breast cancer survivors: a feasibility trial. Clin Breast Cancer. Jun 2010;10(3):224-229. Mendoza-Nunez VM, Hernandez-Monjaraz B, Santiago-Osorio E, et al. Tai Chi exercise increases SOD activity and total antioxidant status in saliva and is linked to an improvement of periodontal disease in the elderly. Oxid Med Cell Longev. 2014;2014:603853. Galantino ML, Callens ML, Cardena GJ, et al. Tai chi for well-being of breast cancer survivors with aromatase inhibitor-associated arthralgias: a feasibility study. Altern Ther Health Med. Nov-Dec 2013;19(6):38-44. Salmoirago-Blotcher E, Wayne P, Bock BC, et al. Design and methods of the Gentle Cardiac Rehabilitation Study—A behavioral study of tai chi exercise for patients not attending cardiac rehabilitation. Contemp Clin Trials. Jul 2015;43:243-251. Tao J, Rao T, Lin L, et al. Evaluation of Tai Chi Yunshou exercises on community-based stroke patients with balance dysfunction: a study protocol of a cluster randomized controlled trial. BMC Complement Altern Med. 2015;15:31. Yang Y, Hao YL, Tian WJ, et al. The effectiveness of Tai Chi for patients with Parkinson’s disease: study protocol for a randomized controlled trial. Trials. 2015;16:111. Irwin MR, Olmstead R, Breen EC, et al. Cognitive behavioral therapy and tai chi reverse cellular and genomic markers of inflammation in late-life insomnia: a randomized controlled trial. Biol Psychiatry. 2015 Nov 15;78(10):721-9. Irwin MR, Olmstead R, Carrillo C, et al. Tai Chi Chih Compared With Cognitive Behavioral Therapy for the Treatment of Insomnia in Survivors of Breast Cancer: A Randomized, Partially Blinded, Noninferiority Trial. J Clin Oncol. 2017 Aug 10;35(23):2656-2665. Wang C, Schmid CH, Fielding RA, et al. Effect of tai chi versus aerobic exercise for fibromyalgia: comparative effectiveness randomized controlled trial. BMJ. Mar 21 2018;360:k851. Wayne PM, Lee MS, Novakowski J, et al. Tai Chi and Qigong for cancer-related symptoms and quality of life: a systematic review and meta-analysis. J Cancer Surviv. Apr 2018;12(2):256-267.